Champion Group and Combined Resources Group: A great combination for investors like you. We believe our exclusive relationship with Combined Resources Group (CRG), an affiliate of Champion Group, offers qualified investors with many advantages in oil and gas investments. You get access to energy industry insiders. Every CRG offering allows our clients to participate along side energy industry insiders. CRG's ability to consistently participate in high quality prospects with superior exploration and production companies has proven to be a formula for success. Past performance offer no guarantee of future results. Choose from select oil and gas projects. We offer our clients what we believe to be the most promising oil and gas projects from the many CRG evaluates. These projects must pass CRG's rigorous, proprietary economic, geologic and risk model, designed specifically with our client's needs in mind. 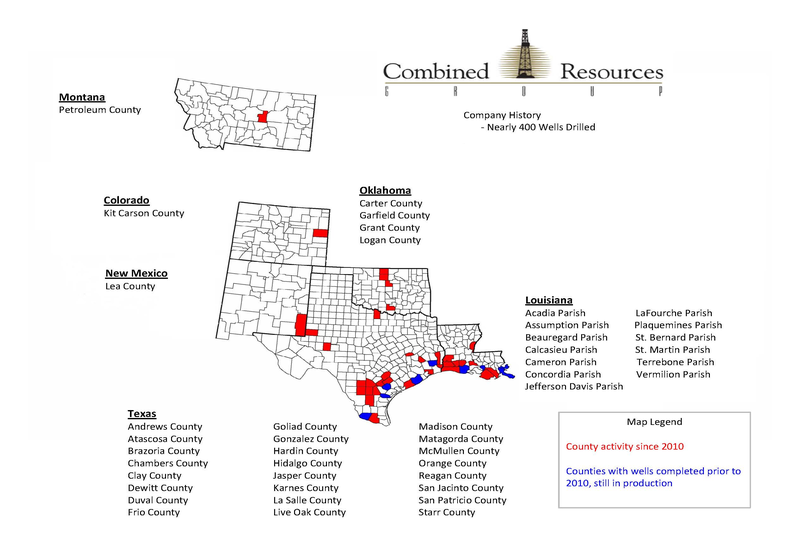 CRG has assembled over 5,000 acres and has drilled and completed ten Eagle Ford wells to date. CRG has assembled over 3,000 acres in the Wolfberry play in Andrews County, Texas. It has drilled and completed eight wells. This play is currently being positioned for sale in 2013. CRG has assembled nearly 4,000 acres in Logan, Grant and Garfiield County in Oklahoma. It has two wells producing and one in its final completion stages in the Cleveland formation. CRG has drilled and will soon complete its first well in the Mississippian formation in Northern Oklahoma. The oil and gas rich Gulf Coast. CRG sets its focus in the oil and gas rich Gulf Coast, primarily in Texas and Louisiana. Known to be one of the most productive drilling areas in the U.S., new technologies are enabling even greater reserves to be recovered from previously productive areas. The easiest place to find oil and gas is where it has already been found. Experts and technology give CRG an edge. CRG's evaluations include securing skilled and experienced geophysical, geological and engineering consultants to monitor their projects. They utilize the latest industry technology from sophisticated computer software to advanced 3-D seismic analysis. All allow them to interpret underground geologic structure more accurately than ever before, and better locate potential oil and gas reserves. Champion Group and CRG with you every step of the way. From prospect selection to operating agreement's from drilling, well completion and production to financial distribution, joint venture accounting and continuous communication we're with you every step of the way. You can count on Champion Group and CRG for a wealth of oil and gas expertise; access to select oil and gas projects; and a strong commitment to client satisfaction in everything we do. Champion Group offers interests to qualified investors in oil and gas partnerships formed by Combined Resources Group (CRG), an affiliate of Champion Group. Combined Resources Group provides office space and phone service for the Champion Group.